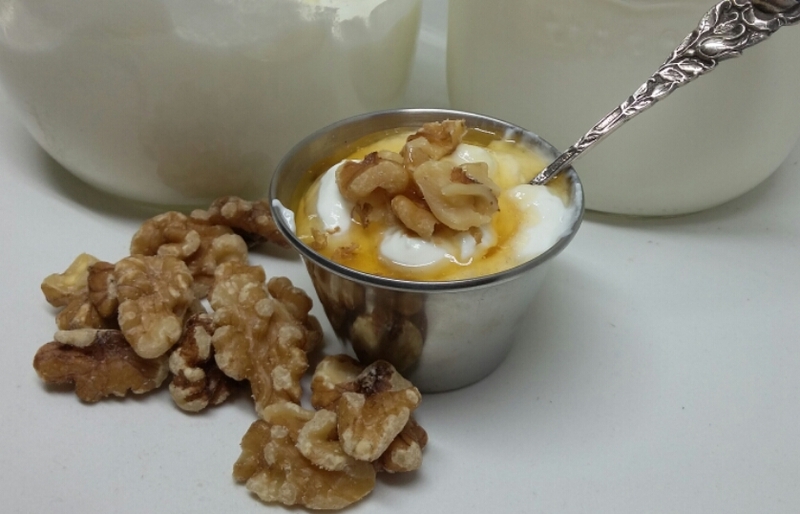 A protein-filled snack: Greek-style yoghurt, with walnuts and honey. Back in the 70’s, when I was but a twinkle in my dad’s eye, my parents lived on the beautiful east coast of Canada, in the province of Newfoundland. Despite working as an engineer, my dad dreamt of being an entrepreneur. My mother made delicious homemade yoghurt, so *lightbulb*, my dad thought this could be the start of a yoghurt business empire. He called up a local hospital and asked them if they would be interested in buying yoghurt for their patients, yoghurt being a health food and all. Alas, apparently the granola-eating, Birkenstock-wearing hippies that the 70’s are known for, had yet to infiltrate Newfoundland. My dad’s future yoghurt empire was shot down by a bacteria-wary dietician, intent on protecting his patients from live cultures. But you all know better, right? Yoghurt is the stuff of gut dreams! Those live cultures are populating your gut with healthy bacteria, helping you fight off gastrointestinal nastiness. And if that doesn’t convince you to make your own yoghurt, well, what about if I tell you that it’s delicious? Easy, inexpensive, healthy, AND delicious! What more could a foodie ask for? Heat milk until close to 180 degrees. (I measured it using a candy thermometer.) Be careful though, when it gets close to 180 degrees, it’s easy to forget about it and let it start boiling — which means a scorched pot. Personally, as long as the temperature is between 150 and 180 degrees, I think it’s all good. Basically, heating the milk means that you’re changing the structure of the proteins, which is necessary for the milk to be cultured into yoghurt. 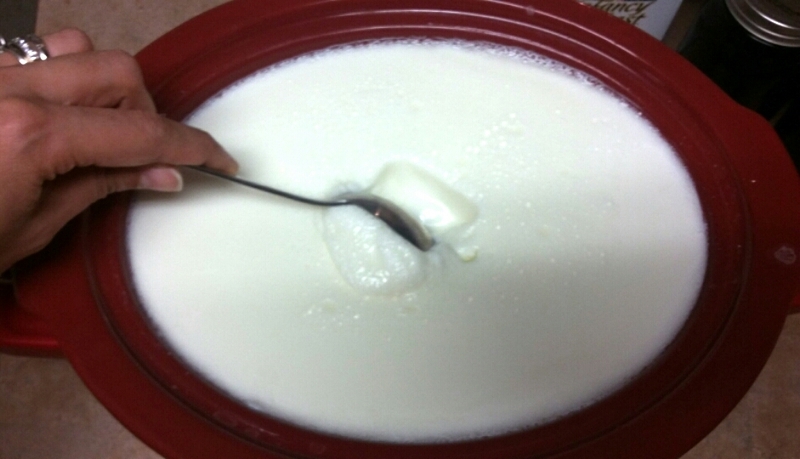 Let milk cool until it reaches 120 degrees, and pour into a slow cooker. Let the mixture cool in the slow cooker until it reaches 110 degrees, and whisk in 1/2 c. of yoghurt and the vanilla extract. The heat of the cooling milk will heat up the ceramic insert in the slow cooker; this helps keep the cultures in the mixture at the ideal temperature for growing and turning that milk into yoghurt. By the way, I’ve forgotten to add the vanilla extract at times, and it doesn’t make much of a difference if you’re going to be stirring in jam anyway, but if you plan to eat it plain, definitely add the extract! Wrap the entire slow-cooker in several towels, and leave for at least 12 hours (overnight works for me). So, you’re not actually using the slow-cooker to cook anything; you’re using it as a heat-retaining receptable. Some people make yoghurt by wrapping a pot of milk in a heating pad, some people make hot boxes for their yoghurt. Me? An unplugged slow-cooker, a few towels, and a good nights sleep mean that I wake up to freshly cultured yoghurt! 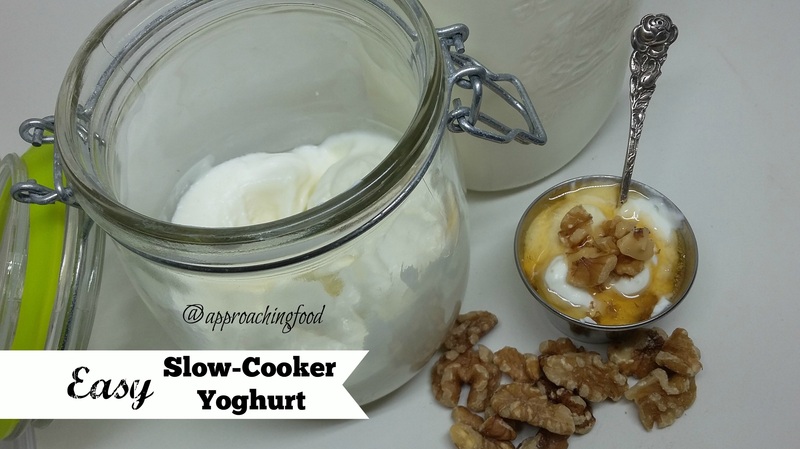 When you open up your slow-cooker after 12 hours, you should be able to see that there is a clear, yellowish liquid around the edges of the yoghurt. That’s the whey, and can be drained off to be used in baking or for adding protein to smoothies, or just mix it back into the yoghurt! This yoghurt will be somewhat thin, depending on whether or not you drain off the whey. But this is what real yoghurt looks like, when there’s no gelatin added in like commercial yoghurt has! To make thick, luscious Greek-style yoghurt, just drain the whey from the yoghurt until the desired thickness is reached. To do so, place a sieve over a bowl, and place some cheesecloth or a clean cotton dishtowel over the sieve. Pour the yoghurt into the sieve and let sit in the fridge for a few hours. Bam! Greek yoghurt, baby! I think I’ve mentioned before on this blog that I’m lactose-intolerant. I can eat food with lactose, but I try to reduce it as much as possible, to reduce my stomach discomfort as much as possible (Except for pizza. For pizza, I will periodically suffer!). The good news is that with this homemade yoghurt, you can make it almost lactose-free! How? Just let the yoghurt incubate for 24 hours as opposed to 12. It will be more sour (because the sugar — i.e. lactose — will have been eaten up by the good bacteria), but hey, less lactose! 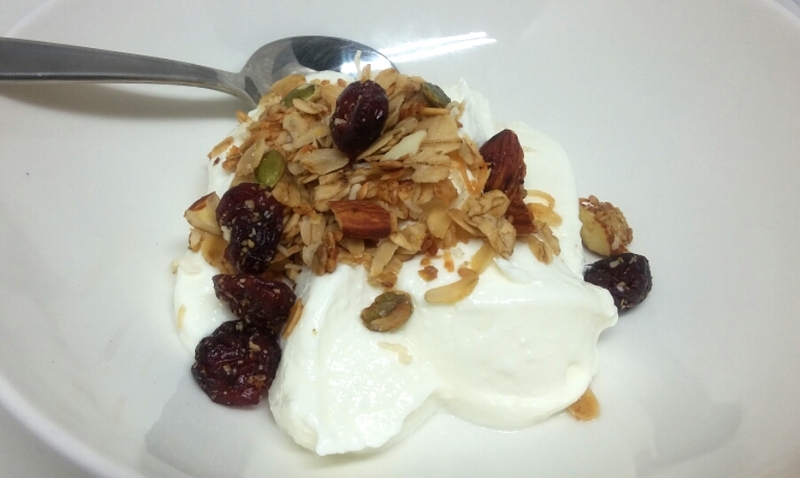 I love eating this yoghurt mixed up with my clean-eating cranberry granola, or with some homemade jam to sweeten it up. Or sprinkled with walnuts and honey! I do love yoghurt…and so does my gut! Next Post: Lentil sprouts! Also easy, also delicious. Plus, it’s fun to watch them grow! Linking up at Meal-Plan Monday! And again! This entry was posted in Breakfast Foods on October 31, 2016 by Margaret. Yum yum, in my tum! Or on top of homemade Greek yoghurt. When I was a kid, I wanted to be a pioneer. I had read all of the Little House on the Prairie books, and wanted to be living on a prairie, making my own bread, sewing, wearing a bonnet, and so on. Today I make my own bread, I sew, and…I don’t wear a bonnet. I’ve tried several recipes over the course of the last few months (chocolate almond granola, anyone?) and found that they all seem to suggest too long a roasting time in the oven. My chocolate almond granola burnt after too long in the oven (which I stubbornly ate, because chocolate). So when I came across a recipe on The Prudent Homemaker website that only called for a short period of roasting, I was intrigued! Speaking of pioneers and hippies, check out The Prudent Homemaker website. This woman has eight kids (!) and manages to homeschool all of them, while growing a hugggge amount of food (in the desert yet), cooking from scratch, AND doing it all on a minute budget. I think she is the closest thing to superwoman I will ever come across. What I really love about the site though, besides the encouraging vibe, is her focus on making life beautiful. I think everyone could use more beauty in their lives. And granola, because this granola is da’ BOMB! (It’s really good, is what I’m saying.) Try it out, modify it to suit your tastes, serve it to others and wait for their stunned reaction when you casually mention that you made it yourself, and pop it into canning jars with pretty labels and give it away as gifts. Which is what I plan to do for Christmas. (Only 2 1/2 months away, people!) The pepitas and dried cranberries give a nice green and red theme to the granola, perfect for Christmas. Mix together everything but the dried fruit, and spread that mixture on a cookie sheet. Bake in a 350 degree oven for about 15 minutes, or until golden and toasty looking. 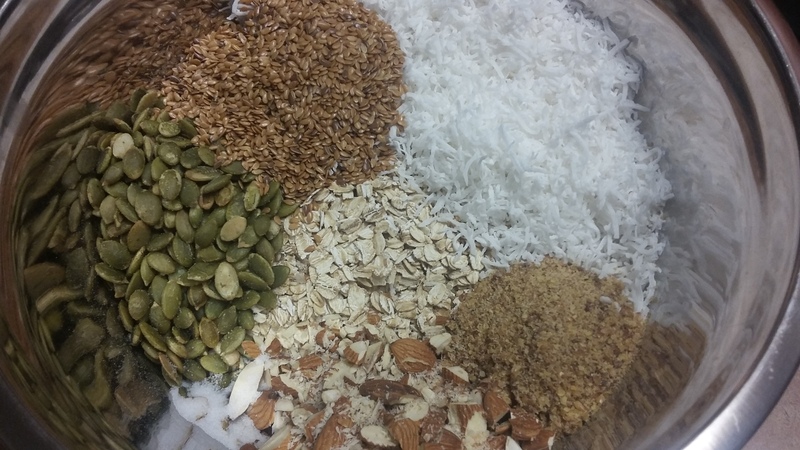 Make sure to stir the mixture once or twice during the roasting, in order to get an evenly toasted granola. If you make this recipe, let me know how you modified it! I’d love to get some inspiration from my blog readers! 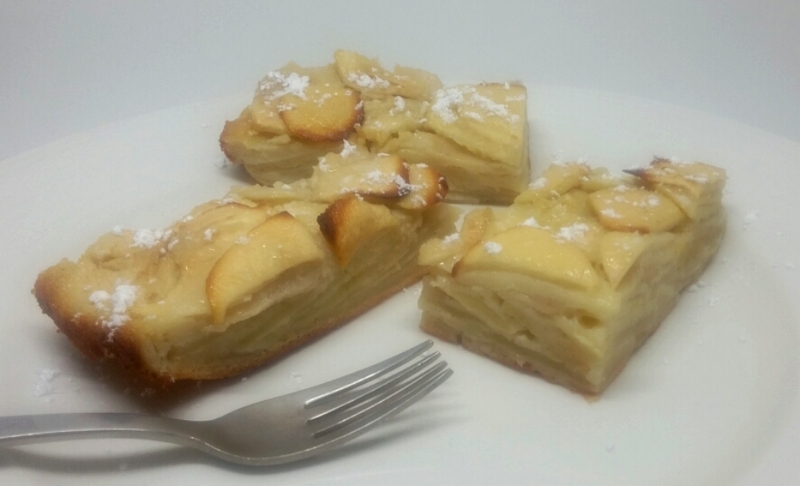 Next Post: Apple Pie, French-Style! Or…easy-peasy homemade yoghurt. 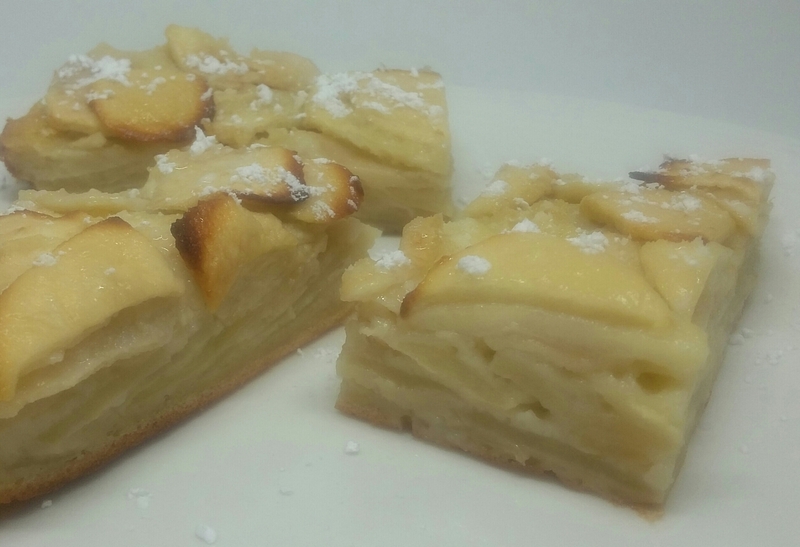 Or apple custard! So many yummy things to blog about, what’s a gal to do! Linking up at Southern Plate this week! And this one! And here too! This entry was posted in Breakfast Foods on October 15, 2016 by Margaret.